Historical Craftivism, Craftivism and the Vietnam War! By Betsy on April 7, 2014 in #HistCraftivism, anti-war., charities + orgs., crafters + makers., feminism + human rights., knitting. Knitting and the Vietnam War?! Really?! Yes! 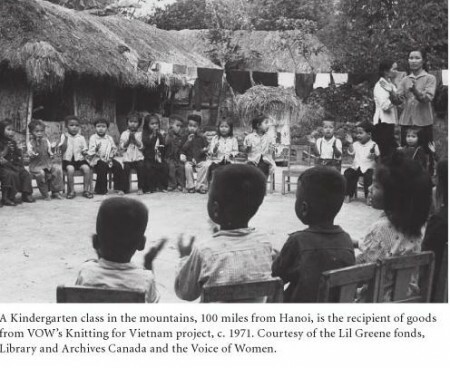 During the Vietnam War, 2 Canadian organizations Canadian Aid for Vietnamese Children (CAVC) and Voice of Women (VOW) used knitting as a way to help the Vietnamese people. Here are some of the links that I found so you can learn more about what happened. I was puzzled, however, as knitting did experience extreme peaks in popularity during wars prior to 1950, however, with the Vietnam war, knitting for wartime efforts played a far smaller role in female participation in war efforts, leading up to the present day, in which knitted goods are virtually absent from discourse on military support efforts. How did knitting go from being such an integral part of the war effort to being a nonexistent one? Voice of Women (VOW) was founded in 1960 whem women across Canada decided they must try to stop what appeared to be imminent nuclear war. The Summit Conference had collapsed; the Cold War was rapidly getting hotter, and we felt women around the world should band together to demand an end to war. Groups like VOW were formed in many countries. By the end of its first year, VOW had 6000 members. It organized an International Women’s Conference in September 1962- the first meeting in Canada to include women from the Soviet Union and other socialist countries. Conference delegates called on the U.N. to designate a World Peace Year. The idea was taken up by Prime Minister Nehru at the UN, and 1965 was proclaimed International Cooperation Year. 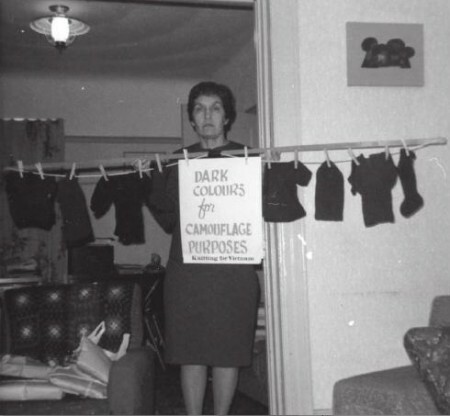 …Young initiated a knitting project to provide clothing for Vietnamese children as a means of communicating the harsh realities of war; she hoped thereby to influence citizens across North America to press for a speedy end to the war. By November 1966, just a few months after the establishment of CAVC’s children’s committee, the knitting project had gained momentum. In a letter to Kay MacPherson, Young asserted, “We have found that actual involvement in ‘making things’ has done more to arouse compassion and publicize the great need for acts of humanitarianism and the desperate need to halt the war, than any other project. The efforts of women fighting for peace did not end with the World Wars, nor did the use of knitting as a form of peace activism stop. The Canadian group ‘Voice of Women’ (VOW), created in July 1960 as a reaction against the Cold War, garnered ten thousand members by 1961 – just twelve months after having been first established. Barbara Roberts’ essay, Women’s Peace Activism in Canada, featured in Kealey and Sangster’s Beyond the Vote: Canadian Women and Politics (1989), explains the way in which VOW became a prominent feminist and peace activist group during the years of the Cold War, despite being founded at a time when “feminists were cranks” and “socialists were commies”. The group took on the initiative of knitting thousands of camouflage baby clothes to be shipped to Vietnam so as to protect children and their families from the US air strikes. This bold action made a loud statement to the Canadian people, and despite not being well received by much of the public, VOW continued to protest the Cold War. 2 Responses to Week #8 of 48 Weeks of Historical Craftivism, Knitting and the Vietnam War! I remember my mother and grandmother knitting garter stitch baby blankets and little sweaters in camouflage colours, and being told that they were for the babies and children suffering in the Vietnam War. I didn’t understand war, but I understood that my mother’s and grandmother’s knitting would keep any child warm and cared-for, because it did so for me and my sister. What a sweet story, Ingrid, thanks so much for sharing it with me! I had never heard of this project before I started researching it, what an amazing endeavor.